Orthodontic treatment corrects teeth and jaw alignment problems and involves the design and use of appliances such as braces, retainers, aligners, rubber bands, and headgears. If you have crowded or overlapping teeth, it makes them harder to clean which increases your chances of tooth decay, gum disease, and eventual tooth loss. With orthodontic treatment, you can improve the health of your teeth and start to smile with confidence! Early intervention and treatment is preferred, since the process is usually quicker and easier. Treatment can begin as early as six or seven, which is when some habits that are formed as a baby can begin to cause unwanted tooth movement. Orthodontic treatment is also available for adults, who can be treated with both fixed and removable appliances. Tooth decay and gum disease - teeth that are not in proper alignment are hard to clean, particularly if they overlap. A build-up of plaque can cause tooth decay and gum disease. Wear and tear - the teeth of the upper and lower jaw are meant to come together in a specific way, with the upper teeth slightly protruding over the lower teeth. If they are misaligned, the action of chewing may grind the teeth unevenly. Jaw injury - the jaw joint is called the temporo-mandibular joint, which is also known as the TMJ. A bad bite may place stress and strain on this joint; this can cause localized problems such as pain, headaches as well as clicking or grinding noises when the jaw opens and closes. Speech impediments - many sounds are made with the tongue against or near the teeth. Misaligned teeth or jaws can interfere with speech. Self-confidence - a person may be reluctant to smile due to misaligned teeth. Once the problems are diagnosed, we create a step-by-step corrective plan. Any existing dental findings will likely need to be addressed before orthodontic treatment can begin. For instance, any decay must be treated and a dental cleaning must be performed. Also, teeth that are causing crowding may need to be removed before orthodontic treatment can be started. Braces - Braces are the most efficient and accurate way of moving teeth. Brackets are cemented to each tooth that needs to be moved with special dental glue and are typically made of a clear ceramic material or stainless steel. These brackets act like a handle on the tooth so that it can be moved into its correct position when force is applied to the brackets. Visits to our office every few weeks are needed to adjust the forces on the teeth as the teeth are slowly moved into a desired position. 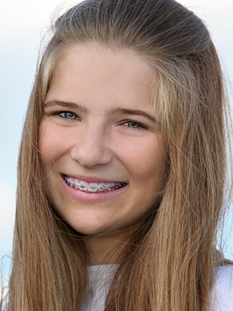 Elastics or rubber bands are sometimes used in orthodontic treatment. Elastics are helpful in aligning the upper and lower jaws. When help is needed to move teeth, elastics may be stretched from these teeth and attached to a bracket on either the upper or lower teeth. It's important to wear the elastics as instructed or orthodontic treatment will take longer. Headgear - if the teeth need extra pressure, headgear and bands may be worn. Basically, tensioned rubber bands are hooked to the braces and connected to a strap worn around the head, usually at night. Dental hygiene problems - braces and wires make cleaning the teeth more difficult. This can cause decay, discoloration and permanent marks. Mouthguards - It is strongly recommended that you obtain a special mouthguard if you play sports involving contact with another player. Relapse - teeth have fibers attached to the roots and those fibers have memory, which can caused properly aligned teeth to rotate out of alignment once the force on the teeth are removed. When wisdom teeth appear, also known as third molars, this can also caused properly aligned teeth to relapse. It is important that you wear your retainers for the prescribed time after fixed treatment has ended. Soft tissue injury - the braces may dig into the gums or cheeks.